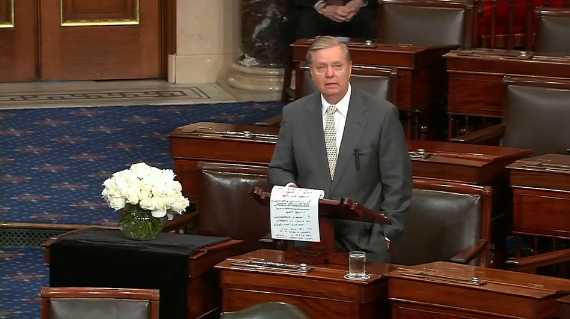 Sen. Lindsey Graham paid tribute to the late Sen. John McCain on the Senate floor Tuesday afternoon, memorializing their storied friendship and McCain's legacy. "He taught me that honor and imperfection are always in competition," Graham said. "I do not cry for a perfect man. I cry for a man who had honor and always was willing to admit to his imperfection." McCain and Graham have been friends since the 1990s. McCain died at 81 Saturday, following a battle with brain cancer that lasted more than a year. Graham listed some of his favorite jokes from McCain, known for speaking his mind — and always willing to crack a joke. Graham said with a smile that he was going to miss McCain's "dumb jokes." "Humiliation and affection were constant companions. The more he humiliated you, the more he liked you. And in that regard I was well served," the South Carolina senator said. Graham recalled McCain's 2008 concession speech as one of the most memorable moments of his long career. "John taught us how to lose," Graham said. "When you go throughout the world, people remember his concession speech as much as anything else. There are so many countries where you can't afford to lose because they'll kill you. And John said that night, 'President Obama is now my president.' So he healed the nation at a time he was hurt. I learned that serving a cause greater than yourself hurts." Graham McCain cannot be replaced, but he believes McCain's legacy can live on still in Americans. "It is going to be a lonely journey for me for a while," Graham said, concluding his speech. "I am going to need your help, and the void to be filled by John's passing is more than I can do. Don't look to me to replace this man. Look to me to remember what he was all about and try to follow in his footsteps. If you want to help me, join the march. If you want to help the country, be more like John McCain. I believe there is a little John McCain in all of us, and the little John McCain practiced by a lot of people can make this a really great nation." In a conversation with reporters after the Senate floor speech, Graham said McCain had some advice about dealing with President Trump, whom McCain frequently criticized. "Talked a little bit about that, he said him where you can just don't get sucked into all his bullshi*t," Graham said. "I said, right. So I'll help him where I can and not get sucked into the other drama. John felt like his view of the world had to be reinforced and the conflict between him and the president has been difficult. He's had it before. He's always hoping that with time maybe things would change but we never got there ..."